When NFL players began taking knees and raising Black Panther fists during games last year, the NFL had to take swift action. It failed.The result is that football has now become politicized, handing the Left another victory in the culture wars. The news behind the news, however, is where the story gets even more depressing. Nobody in their right minds objects to freedom of speech. That is, except UC Berkeley, but the university and its students clear have no actual minds to be right in. However, there are strategic decisions that guides when that speech will be the most effective. Any player who feels strongly enough about his protest for the national anthem owes it to his employer (the team’s owner), the head coach, and his players, to discuss exactly what his feelings are and the most effective manner in which to express them.Any owner or coach would stand behind that player to help him achieve his desired outcome. The player represents the team’s brand. He represents the city. He represents America, the country that gave him the freedom to excel, to become an elite member in the field of American professional sports. The player is paid millions of dollars. To choose the moment, dictated by tradition, to show disrespect for all of these things, shows exceptionally poor judgment. That’s all he had to do. He failed. Now this behavior has spread like a cancer. The owners are the next line of defense. Who is the one owner who has stood up and made it clear that free speech does not exist on private property, or when you are an employee who represents a brand and a team? Jerry Jones, of course, of the Dallas Cowboy’s. America’s Team. Ultimately, the responsibility falls on the players. It is a disgrace that any player should fail to stand for the national anthem, considering what this country has done for them. Yet that’s just the tip of the iceberg. Considering the visibility that NFL players have, they would be infinitely more effective calling attention to an issue outside of the game. Steelers offensive tackle Alejandro Villanueva, a former Army Ranger with three tours in Afghanistan, stood on the field for the anthem. That would be a proud American of Hispanic background who recognizes not only what his country has done for him, but honors the flag and his own service by standing for the anthem. “As a team, we have decided we will not participate in the national anthem. We will not stand for the injustice that has plagued people of color in this country. Out of love for our country and in honor of the sacrifices made on our behalf, we unite to oppose those that would deny our most basic freedoms. We remain committed in continuing to work towards equality and justice for all. If this is what they want to protest, ignoring the anthem which gave these men the opportunities they have had to succeed, is the wrong way to do it. They should be out in the community every chance they get, and engaging in activities that would actually make a difference. It takes no courage at all to stay in the locker room.Courage would mean doing just about anything else – especially spending time with at-risk youths so that they don’t become “victims of injustice”. Instead, the only thing that happens when Odell Beckham Jr. raises a Black Panther salute in the endzone does is annoy fans who are there to escape the daily grind of politics. Of course, the news behind the news is that the swarm of protests is in direct response to President Trump’s tweets that were critical of the NFL’s attitude towards the anthem.This begs a few questions. First, why is the President bothering to get involved?There’s nothing wrong with being a pugilist, but the same rules apply to him about messaging. There doesn’t appear to be an upside in picking this fight.Just like Goodell, a simple statement would have sufficed. So one must look beyond the tweets to see what the protests are really about. They sure aren’t about what the Seahawks claim, or if they are, then these players are utter hypocrites for not actually engaging in life-changing activities. No, it’s identity politics.Again. Still. With Blacks comprising 68 percent of the league, this is yet another example of Trump Derangement Syndrome. Millions of Americans have brought into the nonsense that President Trump is anti-semitic, racist, sexist, transgenderist, racist, white nationalist, neo-confederate, racist, homophobic, racist, Nazi, racist, Islamophobic racist bad man who clubs baby seals. Which, even if that were true, there are still infinitely better ways to protest effectively. 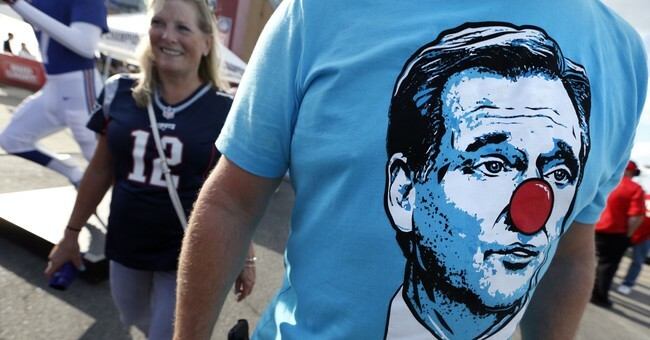 It’s also bad business.Goodell and the owners are driving Americans away from football. Ratings are down again this year, after last year’s decline, which was a direct result of Colin Kaepernick’s temper tantrums. It’s only going to get worse, and it may already be too late. And in case you think this has nothing to do with the culture wars, ask yourself: the same people defending these NFL crybabies are the same ones who mocked Tim Tebow for kneeling to pray when he was on the field. Want to kneel at an NFL game? You’ll find me beside Mr. Tebow. Editors note: An earlier version of this column incorrectly stated that Steelers player T.J. Watt raised over $30 million in Harvey relief funds and stayed in the tunnel during the National Anthem for Sunday's game. His brother J.J. Watt raised that money and T.J. Watt did not play Sunday's game due to an injury.